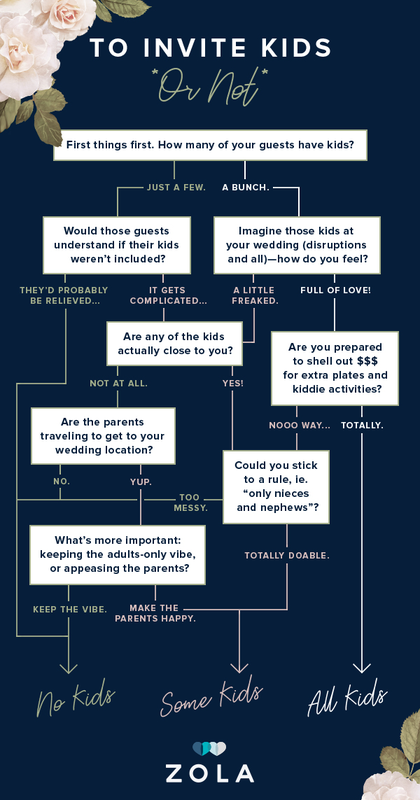 Do you want kids at your wedding reception? Here are some questions to ask. Will my friends with kids be offended that their minis weren’t invited? Will tots steal the thunder from me and my partner? What about relatives, such as nieces and nephews—can I include just them? Do I have to provide childcare if kids are invited (or, for out of town guests, if they aren’t)? Can I invite kids for just a portion of my event, and then ask them to leave early (so I don’t have to worry about kids’ meals, etc.)? 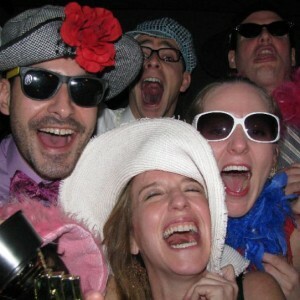 How do I keep children entertained at my wedding? 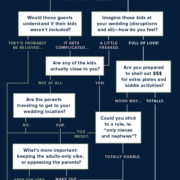 This infographic provided by Zola will help you make a solid decision.